With a hint of spring in the air over the weekend, we headed outdoors to catch up on yard chores. Top of the list, fencing the vegetable gardens. 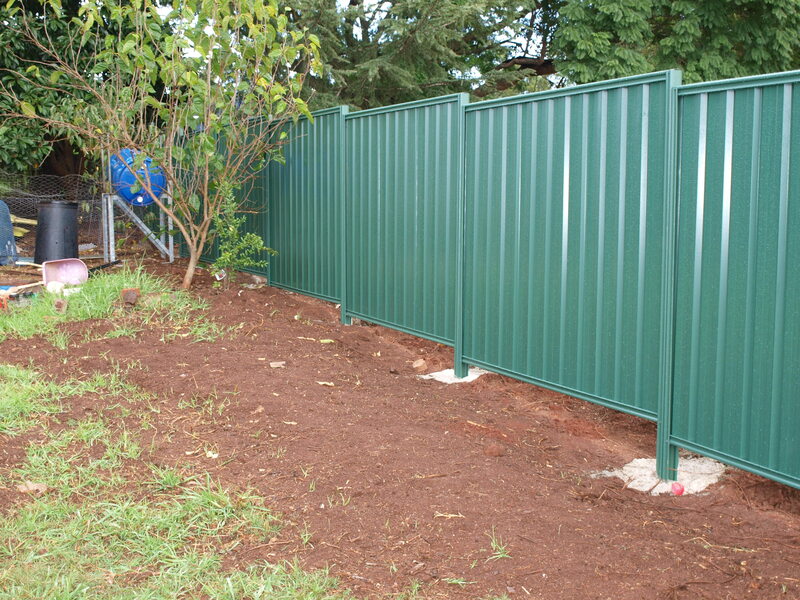 A key part of this new fence included a gate. Due to time constraints with Hubby’s work, we purchased one. (roughly $70 at bunnings) Over the coming weeks, the remaining two beds will be rebuilt and the fence will go around them too. Until then my mini clean up crew is working hard and the veggies will be safe from beaks and claws. sand or gravel – ? Yep it looks as though the raised beds are getting a make over! The Girls new accommodation is now finished. I hung the gate this morning. The floor, walls and roof are all covered in mesh. Hubby jokes it is a wire prison. The total size of the pen 2.5m x 3m around and it stands 2m high. 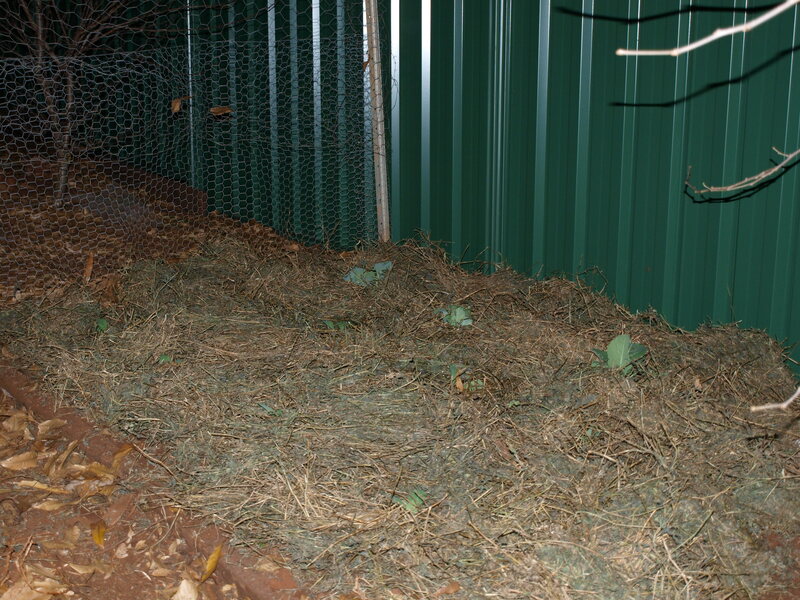 Tomorrow I will be covering the base wire with a light covering of soil and then a layer of deep litter. Also I will disinfect the coop, let it dry and then fill it with fresh straw. As there will be 2 different lots of hens coming in I will be keeping them all in the pen for several days. (Mondays delivery has been postponed to Thursday) Later on the chooks will be able to free range in the back area. 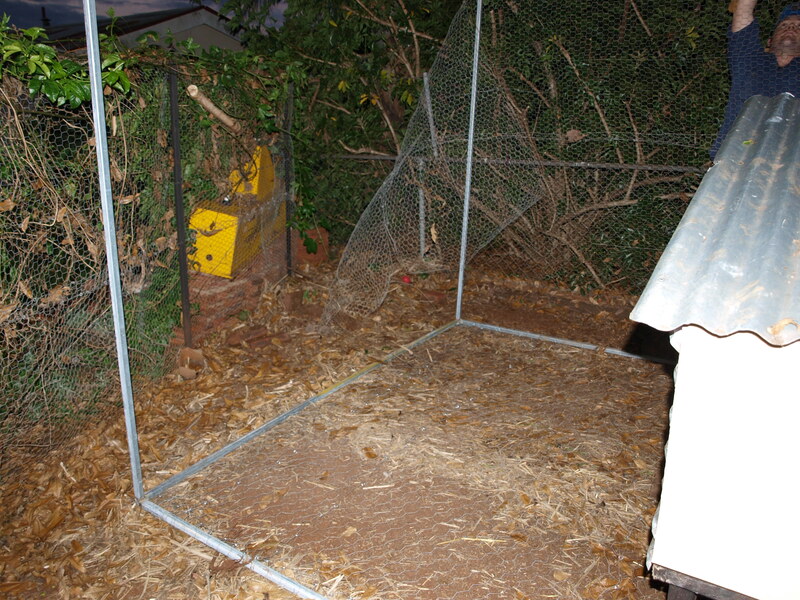 But before they can go into the back area the fence will need to be rebuilt – I recycled the fence into the pen. 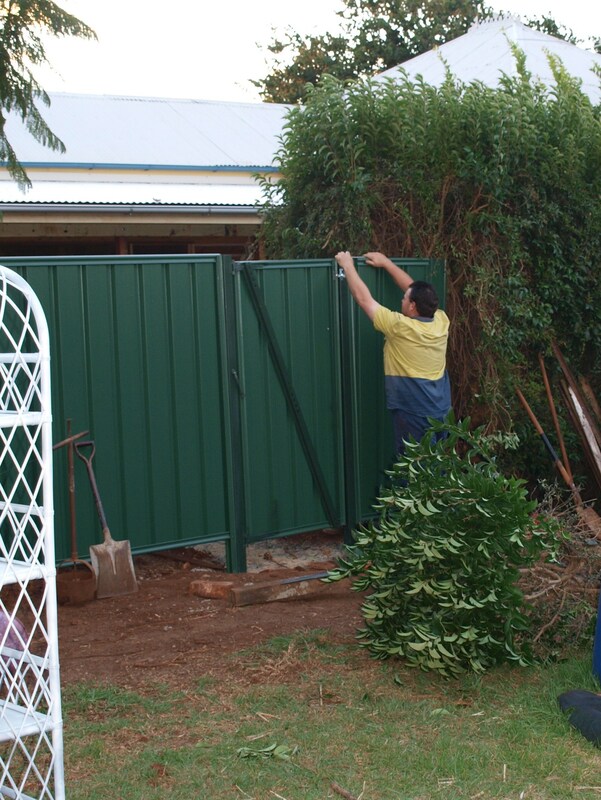 So my next solo project is to built a nice fence for the back area. And I must say a big thank you to my lovely Hubby for his building expertise with the chook accommodation! 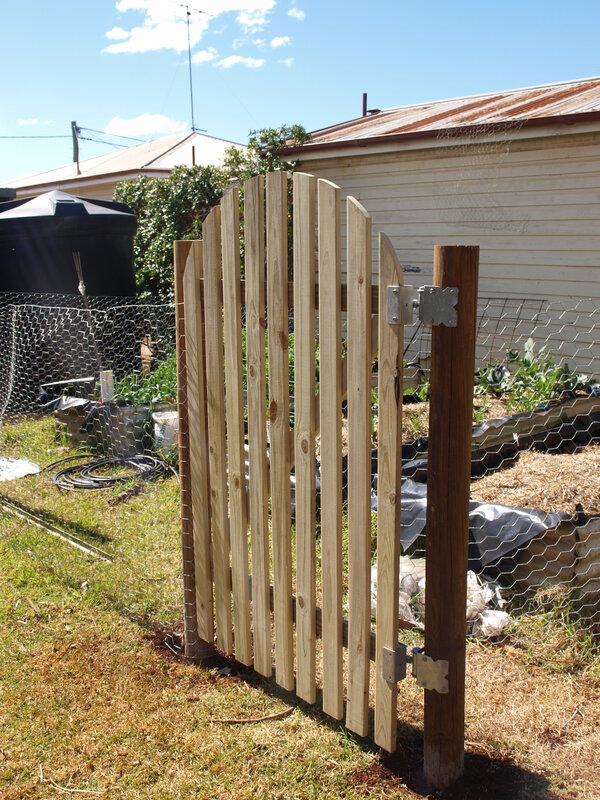 The chook pen is coming together now. At sunset we ran out of mesh wire. The floor is covered with mesh wire too, nothing will be getting in or out of this one! Just that one side to finish now and then the door and the mesh to be tacked on around the coop. Hopefully there will be chooks in there tomorrow. And on Monday 2 special deliveries are coming. 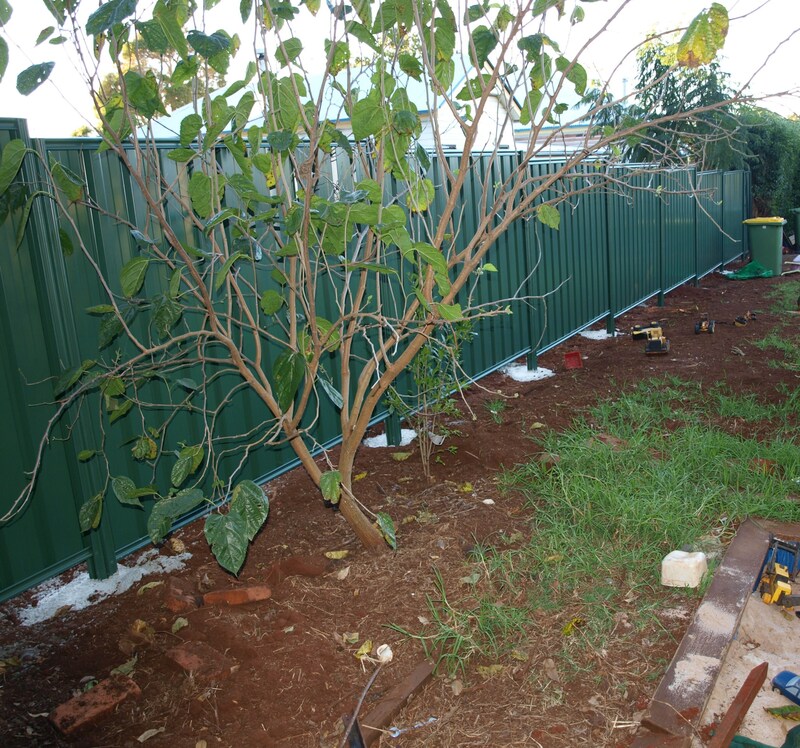 Stay tuned…..
As you can see the chook pen frame is now on site. The wire isn’t on yet but its all there ready to go. The old pen wire with the passion fruit vine on it has to stay, it is very well attached and I like my passion fruits too much to pull it out for looks. Meanwhile with the hedge gone and the new fence in I have gained a lot new garden space, so I am experimenting with what I can grow in this garden. 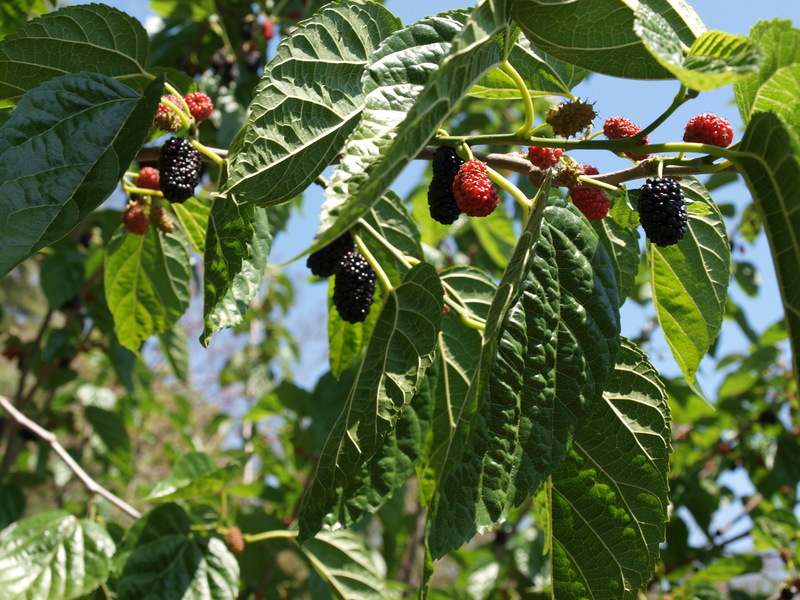 Previously crops were poor, weak and I could not give them enough water. The hedge just robbed the earth of nutrients and moisture. So in this area beside the mulberry tree I have cabbages and cauliflowers. 11 plants in total. Rain is predicted for the next few days, they should take off. For the Locals – QPD has lucerne mulch for $8.50 a bale. Good quality heavy bales. The days are just ticking by, especially now that the days are becoming shorter. 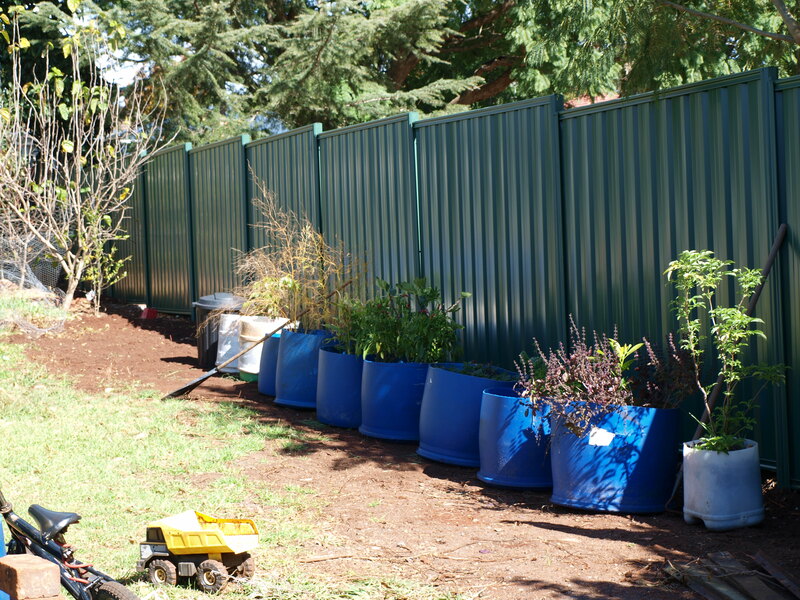 Jobs are slowly being done in the garden, like the blue pots above. They have been moved back against the fence. It has really opened up the yard and the boys are enjoying the extra room for bikes and running. The broccoli and cauliflowers are growing away happily. There has been afew cabbage white butterfly eggs but I have been squishing them when I see them, so no grubs yet. I now have the problem of where will to put the cabbages and other cauliflowers in? I haves some room out the front. It just needs weeding first. 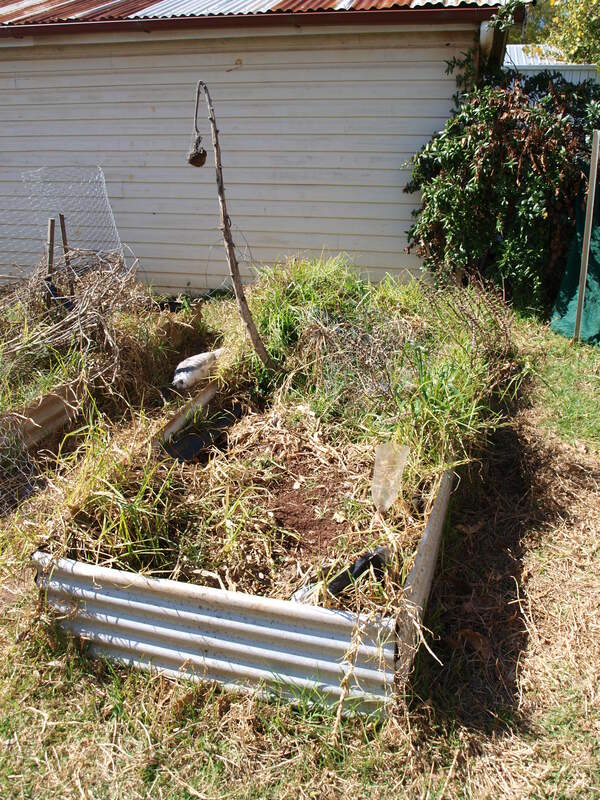 Lots of weeding…. And this is the very top of the Oak tree. 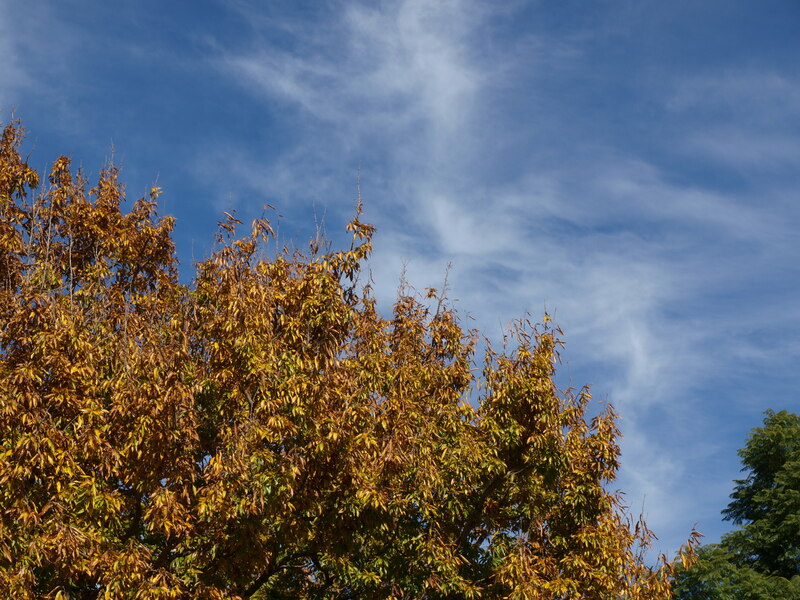 Lovely rusty orange leaves that fall. Everywhere. They are crunchy underfoot and cover everything. I love autumn in my yard! The beginning of the start of our new coop has begun. 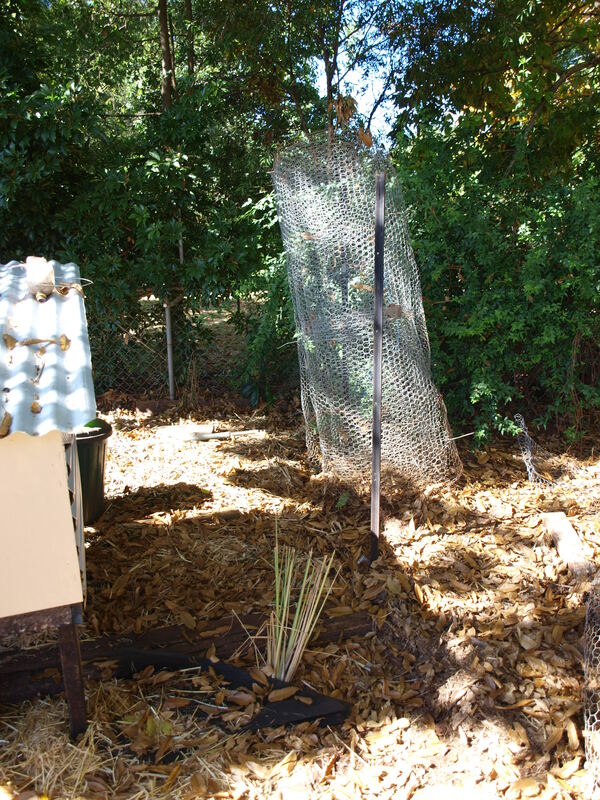 The mulch has been gathered ready to make a compost pile, dishes and water bottles emptied and cleaned and wire has been cut and stored away to reuse on the new pen. There’s still a lot to do, before I can start building the new pen, but hopefully it will go together quickly. I’d love to have the pen up and ready before the 1st Sunday of June when the Darling Downs Poultry and Pigeon Breeders Association has their annual show. There should be some hens for sale, or at least I will be able to meet a few breeders who might have some hens for sale. I’d love a mixture of heritage breeds but I will be happy with whatever I can find. I miss having the girls in the yard. – Still no fox in the cage, tonight is its last chance. Hopefully I will be back with good news all round tomorrow. Edit – the date of the Show is Sunday the 7th of June, which is the first Sunday of the the Month – Sorry! Thank you for your lovely comments, today i just feel really angry and want to be sure this won’t happen again. But no fox yet. Unless it is a scuba fox, its pouring rain. Lovely Lovely Stuff. Hubby was as shocked as I am about all of the girls being gone. He is even more certain now it is a fox. Meanwhile I have discovered that I didn’t realize how much of a routine I had with feeding the girls until I went to put them away yesterday. *bummer* The first time in 3 years I haven’t had a chook in the yard. 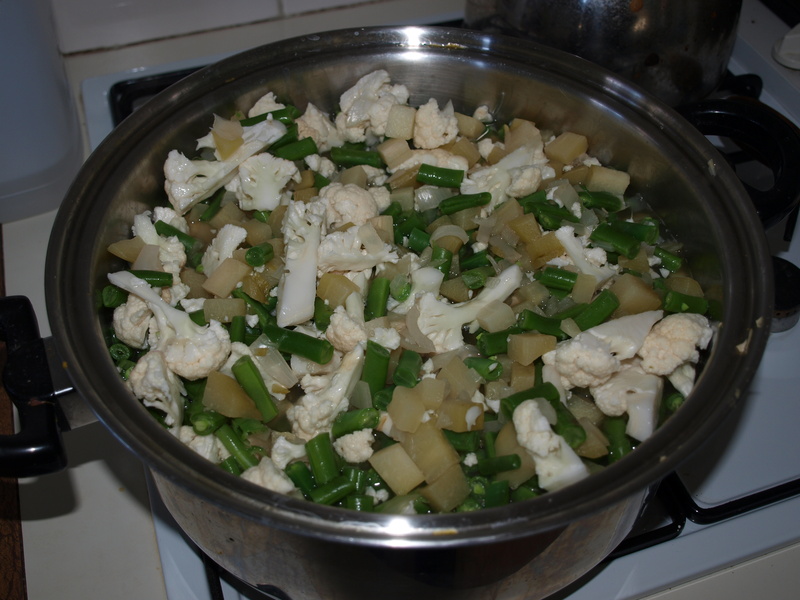 But there will be more – next time I will try to find heritage breeds and I will take my time finding them, instead of my usual, rather spur of the moment ‘I have to have new chooks’ and will take whatever I can get, idea. The trapping cage is being left set up in the coop for a few days to see if I can catch ‘it’. ‘Its’ tummy is probably very full after eating 4 chooks in a week, plus this weather. (No one wants to go out in this….) Yeah there is no chooks left but it knows where to look for more and I certainly don’t want it to happen again. Once the weather has cleared up I will pull down the old night pen and rebuild a fully enclosed one. Hubby’s not too keen on this, but the plans are already on the table, in a typical Emily-fashion I can always make it better. This new night pen will have a roof on it so hopefully the sparrows won’t get in and constantly be messing up the water. You know all those things that you think of or discover later on that really needed to be included with the original build. Yes I only have 2 children in bed tonight. I think they are mine…. I am excited by the possibilities of what can be planted here more vegetables, cottage garden plants, espalier fruit trees. Oh the list is endless. Any major plantings will have to wait until spring just in case the hedge tries to grow back *yikes better not* but I have a 20L drum of roundup just waiting for it to try!